awake, involved and eager to learn! 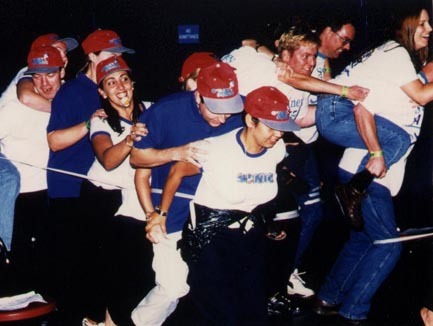 Using the power and versatility of more than 800 fun and engaging training games, exercises, simulations and management tools, WorldGAMES creates precisely the most appropriate program or event for your needs. Each program is totally customised to fit your theme, culture, participant group and required learning outcomes. Fun and enjoyment are key ingredients in all events as learning is richer, easier, more memorable and retained for longer when it is enjoyable. Delivered by master facilitators with a broad range of totally relevant backgrounds you can be sure that your event is in the very best hands. Most WorldGAMES programs ensure that participants are in action or interacting for at least 95% of the time. "We learn 10% of what we read, 15% of what we hear but 80% of what we experience." Size is not a problem. Programs and events have been run for groups as small as 6 and as large as 610. Neither is space a huge issue. Events have been run in more than 100 different venues; in conference rooms with standing room only, at Stadium Australia, the Superdome and in National Parks. Participant evaluations invariably exceed 90% for the overall program and often even higher for the facilitators. All WorldGAMES programs and events come with a no quibble, money-back guarantee of satisfaction. "I would have to say that 6 months after finishing the course, I still remember most of what I learnt during the course, and have continued to build on those experiences. I think this is very impressive considering one week after most courses I have forgotten everything I was supposed to learn ! I think the reason I remember PiB is because it was a hands-on course rather than a traditional classroom theoretical type of teaching. As such, I mostly remember the experiences I had, as opposed to the theoretical teaching, and those experiences mean a lot more to me."